Mineral Rich is a liquid multi-vitamin supplement. It is not specifically marketed as a hair growth supplement, however one of the added benefits I and others have found with taking this supplement is an increase in our normal hair growth rate. This liquid vitamin comes in two flavors, Aloe Vera and cherry flavored. I currently take the cherry flavored one, and with great results. The benefit of taking a liquid vitamin as oppose to a pill is that the liquid absorbs better into your system, therefore giving you better results. A vitamin can have all the right ingredients, but if it does not absorb into your system, then it will not benefit you at all. This is one of the reasons why many people take supplements and see very little results. Their body is not absorbing the nutrients effectively into the bloodstream, that will give them that extra added benefit of increased hair growth. Two things need to happen in order for your hair to grow longer and stronger. You need good blood circulation, not just okay but good healthy blood circulation. You get this from daily exercise and from scalp massages. Once your follicles are stimulated from the good blood circulation, the blood then distributes nutrients into your hair roots. Now if your body does not have adequate nutrients from a good diet, what do you think will happen? You will suffer from weak, brittle and slow hair growth. Your body must have nutrients that get supplied throughout your body, to help the body function at optimum health. So you need good blood circulation and the right amount of nutrients in you body. When you do not have enough nutrients in your system you hair will suffer, you body will supply your vital organs with nutrients first and your hair will get what is left. It is always best to get your vitamins and minerals from good healthy clean food, but the average person does not eat enough clean foods, on a daily basis, for this reason they need help and you get this help from vitamin supplements, such as Mineral Rich liquid vitamin. Always take your supplement with food, it absorbs better this way. Do not take more than the recommended amount stated on the bottle. Always drink a full glass of water when you take your vitamins. When taking single supplements find out what other vitamins you should take with it. There are many vitamins which need another vitamin in order to work properly. For this reason it is best to take a multi-vitamin supplement. My 3 month review of the Mineral Rich liquid multi vitamin supplement. I started taking mineral rich January 2013, the recommended dosage is 2 tablespoons per day with food. To date, I am currently still taking this supplement. 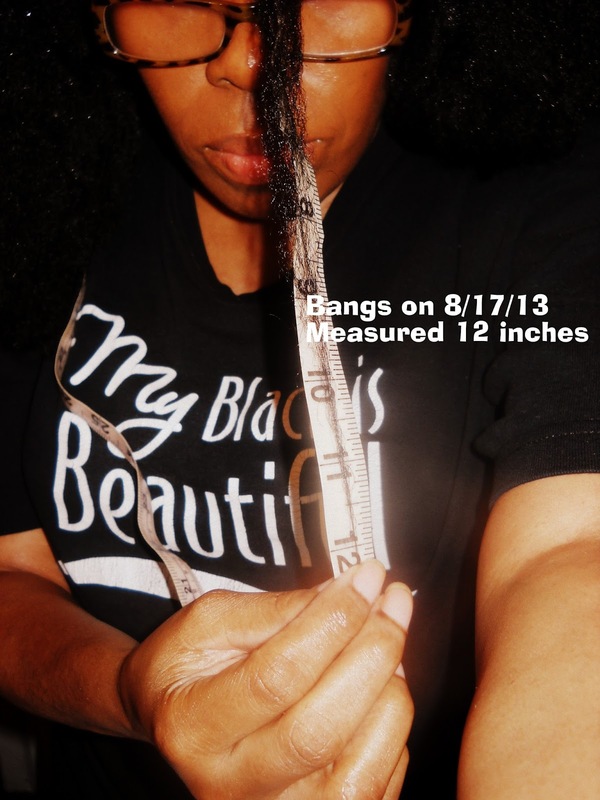 As of my April length check I have gained almost 2 inches. This may not sound like a lot to some but my normal hair growth rate is 1/4 inch per month, so in 3 months I would normally gain 3/4 of an inch, but with mineral rich, I gained, 1 plus 3/4 of an inch. Mineral Rich has doubled my hair growth. Thus far I would say this supplement does increase hair growth as well as being an all around great liquid vitamin for the whole body. Bangs are chin length here . From chin length to 1.5 inches pass chin length. 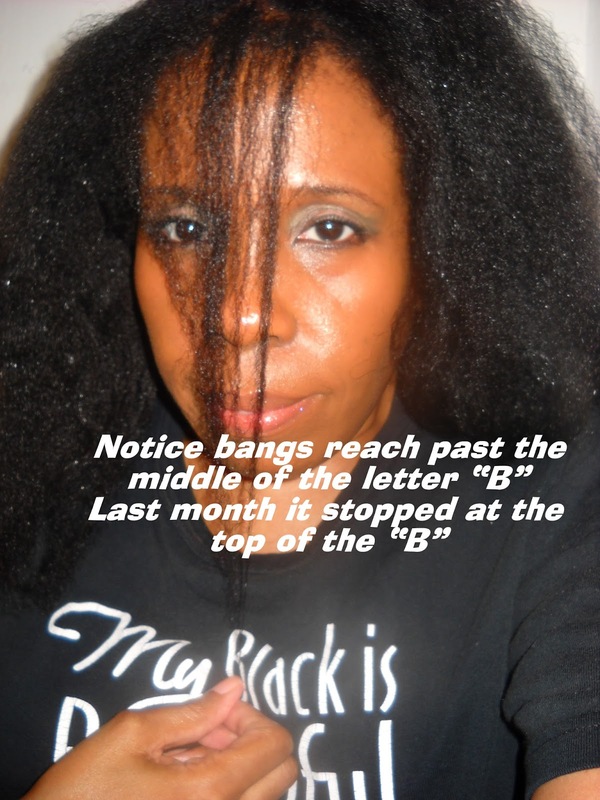 Bangs stop at top of "B"
May and June length check for Mineral Rich liquid vitamin. My bangs now touch my chest area. In the above previous picture they are not touching my chest although the picture looks as though they are. My bangs now measure 11.5 inches. For April 7th-May 7th -June7th-July 7th=3 months. My normal hair growth rate would give me 3/4 of an inch of new growth in 3 months. But taking the Mineral Rich liquid vitamin during this time helped me to gain 1.5 inches of new growth. Again my hair growth rate has doubled. 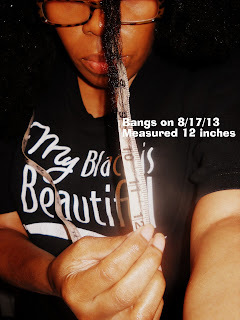 My hair growth for July/Aug is 1/2 inch thus far. Now my bangs measure 12 inches long. If you notice they now reach pass the middle of the letter "B" but in my prior photo they only touched the top of the letter "B". So Mineral Rich liquid vitamin is still keeping me above my normal slow growth rate of 1/4 inch per month. Even considering that I took a break from the supplement for a little while. I plan to continue to take the Mineral Rich at least until October, then I may try something else to see if it will give me even more growth. Have not decided yet, but do stay tuned for my updates. Hair cut: I did take several inches off of my bangs so they now measure 9 inches instead of 12, but watch how fast they grow back and more! If you are reading this and you are a slow hair grower, then I would invest in this vitamin or a liquid vitamin rich in B vitamins. This supplement will double your hair growth rate when taken consistently. Side note: During parts of July I took a 30 day break from the Mineral Rich, so I can measure how much this vitamin is helping me. ORDER YOUR MINERAL RICH LIQUID HERE!!! GOOD MORNING! I AM NEW TO THIS PAGE BUT, I ALREADY FIND IT VERY HELPFUL. WHAT I WOULD LIKE TOO KNOW IS, WHERE CAN WE AS PAGE FOLLOWERS, PURCHASE (MINERAL RICH VITAMIN LIQUID) FROM?? Hello and thank you for visiting my page. If there is a Vitamin Shoppe is your area they sell the Mineral Rich (call ahead of time to be sure) You can also order from amazon.com or google Mineral Rich liquid vitamin. Thank you. You have stunning hair, and sound advice, of which I will follow. I can't wait to start your hair advice and purchase liquid gold and make the conditioners as well as buy mineral rich liquid vitamin. Your website is the best! OMG! YOU ARE SO PERFECT AND AN INSPIRATION. BLACK EXCELLENCE! THANK YOU FOR EXISTING OR MORE SO THANK YOU FOR NOT BEING SELFISH!